Vodafone 4G network to launch with free Sky Sports and Spotify | What Hi-Fi? Vodafone is set to launch its 4G network, the UK's third high-speed mobile network, on August 29th – the same day as the O2 4G network goes live. Interestingly, the Vodafone 4G network will launch with Sky Sports and Spotify bundle options, bringing streaming music and video content to the Vodafone Red 4G-ready plans. 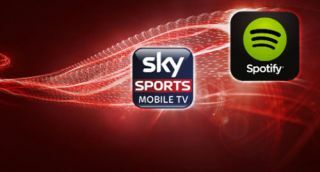 Sign up or upgrade to a Vodafone Red 4G contract and you can choose between either free Spotify Premium or free Sky Sports Mobile TV as part of your deal – and it's free for up to two years, depending on which deal you choose. Vodafone 4G will launch on August 29th in London, before rolling out to 12 more cities by the end of the year. 13 cities in total is perhaps predictably the same number as O2 plan to offer, though the O2 4G network will launch in three places: Bradford, Leeds and London. As with the O2 4G network, Vodafone's network won't be compatible with the iPhone 5 due to the spectrum used. There are three Voda' 4G packages available: Red 4G, Red 4G L and Red 4G XL, with the XL deal offering up to 8GB of data. And if you're not sure how much 4G data you need, Vodafone's Data Test Drive gives you three months to figure it out based on your typical usage. If you're watching Sky Sports video content then it'll be a fair bit, we'd imagine. You'll be able to sign-up from Monday August 12th, with Vodafone offering double the data allowance compared to its existing Red 3G plans, plus unlimited calls and texts. SIM-free 4G deals are available, starting at £26/month.